What if science advanced far enough that we could pick and choose very specific characteristics for the plants, animals, and humans around us? Would we be able go to the pet store and get a dog that is our favorite color and soft to pet? Could rescue dogs have even better senses of smell and hearing to locate lost people better? And how would their new positions affect the personalities of the animals? Compelling characters and an exciting story make Steam’s speculations on these topics fun and challenging for kids. Great illustrations are an added part of the story. Lav, bred to be purple and soft, is raised with Kama, a camouflaged dog with super hearing. But Lav hates the people in the lab because they poke him with needles and don’t understand that Cryp, Kama’s designated future mate, is vicious with him. Lav escapes and finds people he can love. Meantime, Kama is being trained by a human she can love. 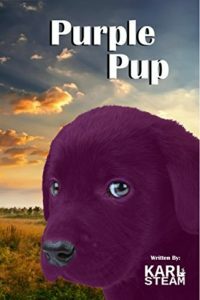 Due to his unusual color, Purple Pup, as Lav is now known, is returned to the lab, but he can’t forget his boy. He then escapes with Kama, Cryp, a miniature gorilla, and a miniature lion. They live in the woods with a wolf pack until Lav’s purple coat is again spotted. Given all the discussion about GMOs and mapping genomes, this is a good place to get third graders started on the possible scientific results of manipulation. Many activities can arise from caring about Lav and his friends.